He has an I.Q. of 179, but strangely, even though he has a high I.Q., he is constantly outsmarted by Ai. He also has the talent of calculating. 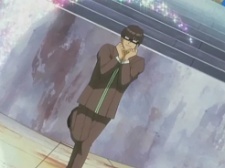 He named his glasses Bianca, after falling in love with them during his fight with Ai. Mori suspects he is a pervert, but he denies these claims and states that he has an I.Q of 179 as a counter.